The Churn Dash quilt block is also known as Monkey Wrench. The Monkey Wrench block was featured as one of the quilt blocks that helped slaves find the escape routes along the "Underground Railroad". So, it has some interesting history. 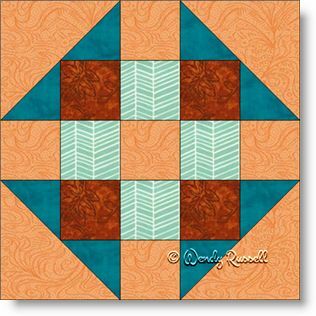 This variation adds some extra half square triangle pieces to the original 10" block, which is nice for those wanting to express a little more of their skills. However, this version is still a very easy block to make. The two sample quilts illustrated both feature the quilt blocks on point but vary slightly as additional corners have been added to one version while sashing and extra blank blocks are features of the second quilt. All in all, there is no limit to your creativity for your own heirloom quilt.